I have asked Twitter, and search on the forum - but not yet found an explanation as to why the Exclude Disks behaves the way that it does. Why doesn't screen show the real attached Disks, SCSI 0:0, 0:1, 0:2, 1:0 etc.. This would make the selection/deselecting much easier, as well as actually verifying what you ARE backing up when you select a particular machine. Going the next step would be a display of the actual Disk size. You could for example have virtual guest Log drives or Backup drives, which you would not want to back up. These would be easily identifiable if you knew that the local Log disk was 50Gb, or the Backup Disk 500Gb. I don’t know what the correct procedure is for submitting Enhancement Requests, but I feel that these two changes would make sense in a future update to an excellent product. nickfurnell wrote: The next screen always defaults to just displaying SCSI 0:0 & 0:1. Why doesn't screen show the real attached Disks, SCSI 0:0, 0:1, 0:2, 1:0 etc.. If I got you correct, the next screen defaults to the option to process all disks (first radiobutton). If you select the third option, then you can actually select which disks to process and what disks to skip. By default this option is not selected, so the screen below is not intended to show all virtual disks attached. nickfurnell wrote: This would make the selection/deselecting much easier, as well as actually verifying what you ARE backing up when you select a particular machine. Well... if you select the third option you do know what disks you're backing up and if the first one is selected, then your job processes all disks. Hope this makes sense. Thanks for the feedback anyway! You are correct, but you missed my point. 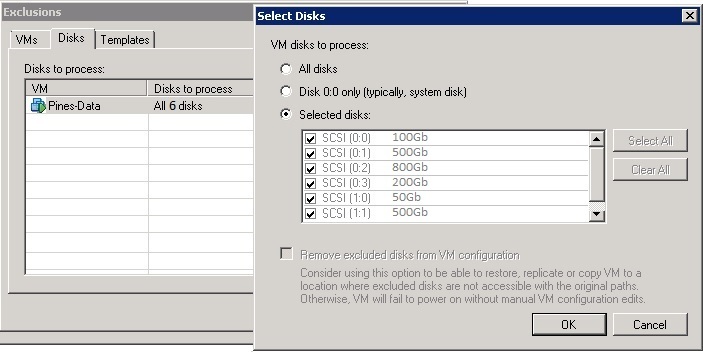 When you select the 3rd radio button "selected disks" it ALWAYS displays SCSI 0:0 & 0:1 even if your VM guest has one disk or 5 disks attached. My point is that the better solution would be to interrogate the guest VM and display the actual disks - maybe with them already ticked. After all the option is labeled "Exclude Disks". The Disk/Volume sizes are just a nice feature - again it would make the selection easier. Currently I need vCenter open at the same time, to Edit and check the Disks attached and then Console to the machine to see which drives are used for Logs, Backups or scratch files etc..
nickfurnell wrote: You are correct, but you missed my point. When you select the 3rd radio button "selected disks" it ALWAYS displays SCSI 0:0 & 0:1 even if your VM guest has one disk or 5 disks attached. You are not thinking about all the possible scenarios here... what if 2 more disks are attached to this VM on the next day? We want the user to be able to tick all required SCSI ports right-away, only this way you can create a deployment that is truly "set and forget". For example, have a rule where any virtual disk that is added to bus 1 is automatically picked up by the job (because those are application data disks). In the end, last thing you want is someone adding the new disk to a VM, losing the VM a few days later, and finding out that the newly added virtual disk was not backed up at all due to disk exclusion rules on the given VM... People may not even know about backup side of things, and even if they do, they tend to forget things. I understand not everyone is commonly adding or removing virtual disks to VMs in your environment, but this is a very common use case generally. And when you have thousands of VMs, micro-managing your jobs after each VM disk configuration change is hardly doable. nickfurnell wrote: Currently I need vCenter open at the same time, to Edit and check the Disks attached and then Console to the machine to see which drives are used for Logs, Backups or scratch files etc.. This is generally not a scalable approach beyond a few VMs (in terms of management overhead). If you are looking to grow your virtual environment significantly, I would recommend that you standardize on virtual disk roles, so that each VM is largely the same. For example, drive 0:1 is always system, 0:2 is swap, 0:3 is logs, 1:x are application data disks (you get the idea). If the specific VM does not run application that needs logs or scratch location (for example), then the VM will simply not have the virtual disk attached to the corresponding SCSI controller port. Hope this makes sense. Suggestion #1: adjust language in VBR Edit Backup Job forms to clarify intent - use "Disks to back up" instead of "Disks to process"
Suggestion #2 (better perhaps): use separate button to edit disks to backup, as it is confusing to add items to back up, under "exclusions"
I realize that Disk exclusions are well documented in http://helpcenter.veeam.com, but the simple process is unnecessarily baffling to novice users due to word choice and lack of parallel structure. When editing a job and you click EXCLUSIONS button, it pops up a form that has 3 tabs (vms, disks, templates). The title of the form is Exclusions. Thanks for your suggestions, Matt. Much appreciated. Just going back to what Nick suggested (which I think is a great idea) and then Gostev's response (which is valid) - what about this? a) Have a radio button for "Include" or "Exclude" (at the top of the window) which adjusts the behavior of the list and tick boxes (that way, you can click exclude, and just tick one disk). b) Interrogate the VM to list disk sizes etc. while stilling listing all possible disks so as to allow for disks which haven't been added/created yet, but still showing capacity for those that have. Are there any future plans to allow disk exclusion to access the guest OS and pass on the volume letters? I'm new to Veeam (coming from managing mostly ShadowProtect & AppAssure BDR's) - from a management perspective, it seems to me a bit more straightforward to work with volume letters, rather than the vhdx number in the hypervisor. There are various instances where we may exclude particular volumes, and when managing a large volume of backups across multiple BDR's, in my opinion it's much simpler/quicker to work with volume letters E and G (for example) - rather than say IDE (1:0) and SCSI (0:1). It's a bit like DNS... It's much easier to remember and work with domain names such as google.com, dell.com or ibm.com rather than trying to remember their IP addresses. Is this a capability that could be added to Veeam? Having fallen foul of this again I decided to post. 1. I selected 'exclusions' and I am now being asked what I do NOT want to exclude. Which is the opposite of what I clicked on. Not then reading the text at the top about which disks to process means that you TICK the disks you want to 'exclude', and they are actually the only ones that are then backed up. 2. If you are trying to create a 'set and forget' backup program you should have the opposite logic to the current one. Ie, it should backup everything except the 'exceptions' that you select. That way any new disks are added to the backup job, but only the one you excluded months ago is still excluded. With the current logic, you need to remember to go back in and add any new disks...? Unless it automatically adds them currently, but I don't believe it does? Disks are not added to exclusions automatically. Thanks for the feedback.